If there is one place that ‘You get what you pay for’ applies, it’s in footwear. Skimp on the boots and you will quickly come to regret it, just ask anyone who spent any time in the armed forces. Good boots are hard to find when cheap knock-offs look just like high-end gear. The devil is in the details, a boot can only be as good as its materials and construction. 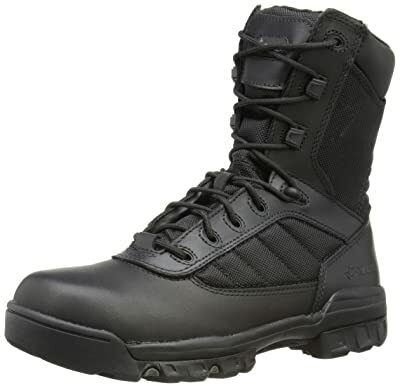 No matter your need, whether you are a first responder, avid outdoorsman, or just a connoisseur of tactical gear, you want to get the best tactical boots your money can buy. 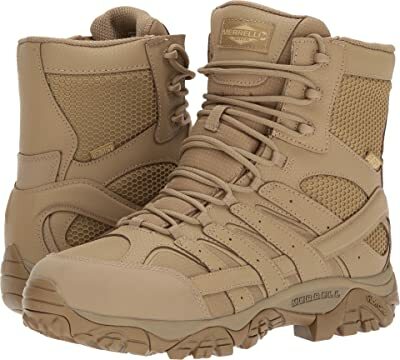 Danner has specialized in military footwear for almost 80 years. That’s a lot of expertise brought to bear on their Acadia tactical boot. Add their professionalism to a keen eye for materials and design and you get one of the best boot ever made. The Acadia is a part of Danner’s premium made in America line of boots and the quality really shows. Some Danner boots are made overseas and seem to lack in quality but stick with the U.S. made Danners if you want the best in quality. Clad in tough, full grain leather and ballistic nylon with a breathable, waterproof Gore-Tex liner, these boots will keep your feet dry and protected from any environment. Featuring a stitched down construction for maximum strength and durability they will last for years. Vibram soles will save your knees if your beat is on the hard surfaces of an urban environment but the lugged soles will give you grip anywhere. These carry a premium price but are a premium product and if they ever start to fall apart, send them back to Danner for repairs. Who would guess that one of the top tactical boots in the world would come from a company more associated with leisure camping than the military world? Salomon produces some amazing products well known in the long-range hiking world and their craftsmanship lends itself well to the world of hard wearing tactical footwear. Steering away from their normal brightly colored shoes, Saloman’s tactical black boots provide some of the best stability available in a boot anywhere. Full grain leather and ballistic nylon create a tough, solid piece of footwear and the inner EVA sole provides all-day comfort. The cleverly contoured outer sole provides a natural gait perfect for long hours on your feet. Grips well on the tarmac but can take you off-road with the same confidence. Cheaper than the Danner but still pricey, these are a solid option! 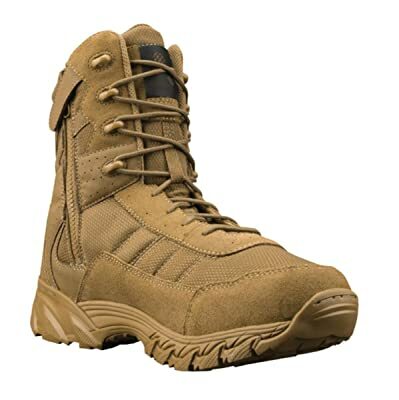 The growth in popularity of tactical gear has created a market that footwear companies with names more closely associated with outdoor pursuits have quickly filled with quality products. Much like Saloman, Merrell is known for hiking boots, some of the best on the market. Unlike companies who have specialized in tactical footwear, these companies have focused more on comfort features rather than purely utilitarian designs. That’s not to say that their boots aren’t tough as nails, just that the starting point was in comfort. Merrell shoes are highly popular with the type of people who abuse themselves and their footwear on a regular basis like trail runners and long-range hikers. Their Vibram soles are known for mile after mile comfort and reliability. In the case of Merrell tactical boot, it’s the whole package with every feature you could want. Waterproof membrane, gusseted tongue, abrasion resistant toe cap, and a body made of leather and rip-stop nylon. If you want comfort and reliability, there are far worse places to look than Merrell. At some unidentifiable point in the past, a company known for its athletic gear branched out into the world of tactical footwear. Normally something like this is met with marginal success at best but not in the case of Under Armor. They have pursued quality in footwear with the same fervor that led to some of the most high-tech clothing on the market. 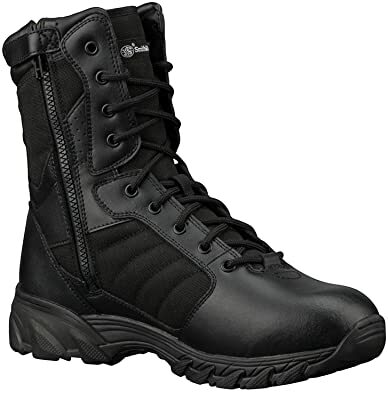 If your need is more comfort in your footwear with long hours on your feet, these are a great boot for you. They may not excel in long-range hiking but they will keep your feet cool and dry no matter what your environment. The insole is above and beyond the most comfortable in tactical boots anywhere and provides a springy step that saves energy in your daily grind. As far as fit and support, Under Armor has revolutionized the whole process. You can’t possibly understand until you have worn them. Belleville is a very recognized name in the military community. Many of us wore them in basic training in years past. They stood up well to the grueling miles then and haven’t changed with time. Belleville’s are solid, durable, and functional above all else. For a company that has made military boots since 1917, the kinks in the process were probably worked out a long time ago. What you get now is a refined product with generations of knowledge put into it. Let’s get this straight, Belleville may have made the boots your great-grandfather fought in but these are not them. 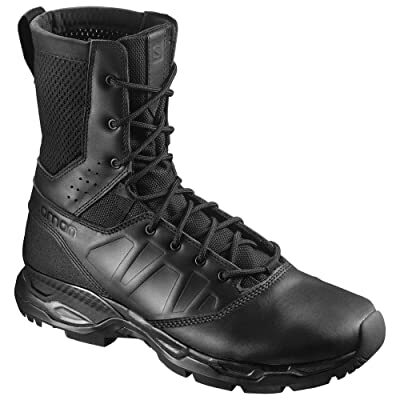 These are a modern tactical boot with all the features needed to support today’s military and first responders. Full grain leather and nylon body with a reinforced toe and heel and an aggressive Vibram sole will keep your feet firmly planted. The boots feature a breathable liner for long wear and a load bearing insole designed for carrying a ruck or whatever else your job requires. For the price, these boots are top notch! Those that didn’t wear Belleville in the military probably wore Bates just like hundreds of thousands of U.S. soldiers, marines, and airmen have since World War I. Bates made military footwear as a brand up until the Vietnam conflict when they were bought out by Wolverine. 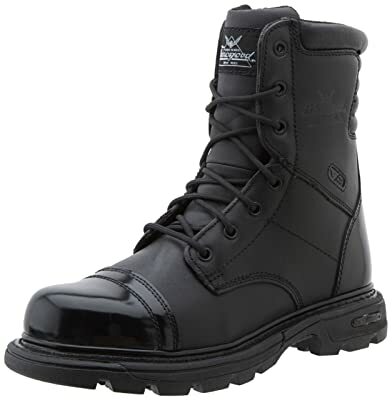 There is a reason these boots are so common in the early career of many military personnel. They are solid, durable, and comfortable while not breaking the bank. For the price, there are probably no boots better. Leather and nylon outers and a solid shank keep your foot supported while the aggressive tread will help you avoid losing your footing. If you are looking for a boot that will serve you for years but your budget is a little tight, go with Bates and be confident in your choice. In early 2003 a company that was less than a decade old designed a pair of pants that was adopted by the FBI. That success catapulted them into the marketplace and they started revolutionizing the world of tactical duty gear. Everything from clothing to backpacks, 5.11 makes it. The A.T.A.C. 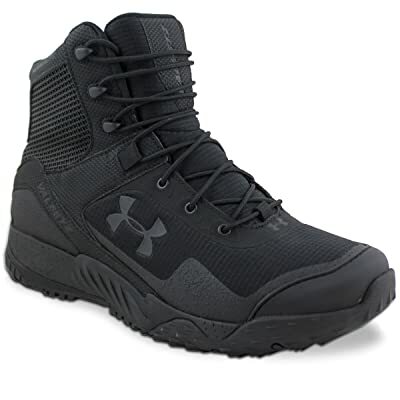 is the flagship boot of 5.11 and their number one selling footwear option. With a reinforced toe, slip resistant outsole, and an injection molded Phylon midsole, these are hard wearing boots meant for high impact surfaces. The full grain leather shell with a breathable liner keeps your feet dry and has the classic look that most people expect from tactical footwear. 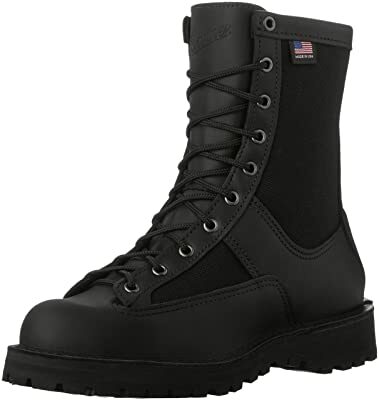 For a uniform boot, these are a good-looking option but aren’t flashy enough to stand out in tactical applications. For a boot by a new company I would call these exceptional. The materials are good quality and the craftsmanship is better than most boots in this price range. Normally boots by new companies are marginal at best, its good to see someone break the mold. Like many quality footwear companies, Thorogood has been in business since your granddaddy was in diapers. They started out in the world of work boots where they designed one of the first dedicated job-site boots with safety in mind all the way back in 1892. Though they were bought out by Weinbrenner shoes, they are still produced with quality and craftsmanship in Wyoming by men who know a thing or two about boots. When you’ve been in the business for as long as Thorogood, you should have it all figured out by now. These may be tactical boots but they still have a touch of class with a high shine leather toe cap and heel. Dual hardness rubber outsoles provide durability with a little cushion on impact. Made of full grain leather without the normal nylon side panels, these boots are sharp and tough as nails without adding too much weight. If your job requires a little more dress, these boots are the way to go. They are still hard-wearing boots with just enough class to set you apart when you need it. 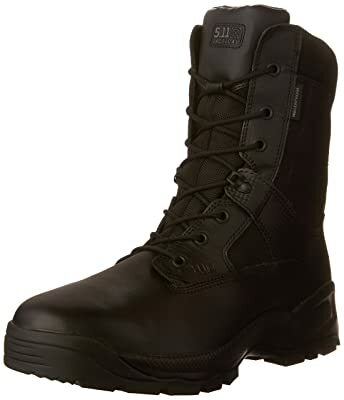 For a uniform boot, these are a solid choice. Hard to snug up laces with larger calves. There was a time that Altima boots were considered budget options and had a quality to match. The price hasn’t changed much but their quality has. Dollar for dollar, Altima are very hard to beat. They may not be an old brand with years of experience but they have been in the boot game long enough to know how to play. Their Vengeance series are dedicated urban boots with a tactile grip on the bottom that won’t slip on wet or oily surfaces coupled with lightweight materials to avoid fatigue. There are no metal parts in the boot making them friendly for places with metal detectors. The insoles are soft but supportive and antimicrobial to prevent sweat odors and infections. In addition to slip resistance, the outsoles are softer and provide great traction on slick surfaces and keep enough bounce in your step to avoid any strain. If your budget is tight, these are a quality boot that will last. The name Smith & Wesson is widely known and in the firearm community, their firearms have a solid reputation for quality craftsmanship. Though not all products with their name have the same well-built status. It’s good to approach some of the Smith & Wesson branded products with some skepticism but with these boots, they hit the mark. These boots are licensed to Original Footwear who owns Altima. The quality is consistent between the brands. Where the Altima boots are geared more toward the urban environment, the S&W Breach are true multi-terrain boots with plenty of traction and a more rigid outsole. The shanks are steel which won’t pass a metal detector but will provide a lifetime of durability. Otherwise, you can expect features very similar to the Altima Vengeance. They aren’t as slip resistant or bouncy but they are still quite comfortable for the money. The boot best suited to an individual is a very personal thing. Not only are each person’s feet unique but so are their ankles and calves. That’s not to mention daily workload, environment, value, and personal preference. Picking a pair of boots best for you is a hard choice and one that shouldn’t be taken lightly. Good quality boots are expensive but money spent well on the right boots is a solid investment. Money wasted on cheap boots will be regrettable at best. Always buy the best boots you can afford. Don’t skimp or make a poor choice to save money. With any boot on this list, you are going to get what you pay for. That said, a $400.00 pair of boots won’t fit everyone’s budget but most people can swing $70.00. If the best you can afford is a pair of Altimas, know that many people, myself included, started with Altima and did well but most of us upgraded as soon as we could. If you can manage to start off with a better pair of boots, you will save yourself money and grief in the long run. How boots fits are vital to their comfort. If you get a boot that is too tight or too loose, you are likely going to end up with hot spots or blisters, especially when breaking them in. Very few places sell a variety of boots to test for fit so your best option may be to consult the reviews. If you shop for boots on Amazon, right below the price is a section on fit. If you click there you can go to fit reviews which is an amazing tool to get you get in the ballpark of the size you need. Some boots run narrower or wider than others, even in the same brand. Regardless, I recommend trying on your boots and wearing them in the house for several hours. If they seem as if they aren’t going to fit once broken in, return them. It’s a headache but one well worth it! Your personal needs and environment will ultimately dictate the style of boot that is best for you. The Saloman and Merrell boots are dedicated outdoorsman boots. They will perform best on the trail or in the woods. The Altima and Under Armor are far more suited to city streets and indoor floors. Most of the rest of the boots try to find some mid-ground between. I recommend a 70-30 rule. If you spend 70% or more of your time in an environment suited to a specific boot, get that boot. If you spend less than 70% of your time in any specific environment, go with a mid-ground boot. All these boots should do well wherever you end up but your best results will be with the right style of boot. When you get a new pair of boots, make sure you let them wear in before spending all day in them. Depending on how much leather the boot has and how stiff it is will dictate how long that will take. Most boots will wear in in about a week but some boots may take up to two weeks to be comfortable. Always wear heavy socks when breaking in boots. It’s also better to do a break in process in the winter or in colder weather. If it’s summer or a warmer climate, consider changing your boots about midday when it gets the hottest. Your feet will swell as they get warmer and the boot will rub more, especially if your feet sweat. There are a lot of shortcuts to breaking in a pair of boots but take the time to do it right. Also, consult any manufacturer recommendations to protect your investment and any warranty your boots may carry. Good boots are hard to find. For every decent brand, there are thirty bad ones. Steer clear of names you have never heard of or ones associated with store brands. They make look the same but I promise you, they aren’t. Modern boot technology has been around for a century with only the materials changing. The craftsmanship that goes into a high-quality piece of footwear takes time to work out. There are nuances to fit and comfort that most new brands seem to overlook. The old brands have done it best. The ones that have produced boots or shoes for generations. Some of the newcomers are doing pretty well but most of them have been in the boot and shoe business for decades. Stick with these brands! Do your research and dedicate the time to really finding what boot you want; the time will be well spent and you will get a lot more satisfaction out of your purchase! Always take care of your feet and your feet will take care of you. Bonus tip: Air out your feet often if they sweat. Take off your boots and let your feet and footwear dry out. Not only is this healthy for your feet but its easier on your boots. Best Hunting Boots 2019 – Are Rubber Boots the Best Choice? 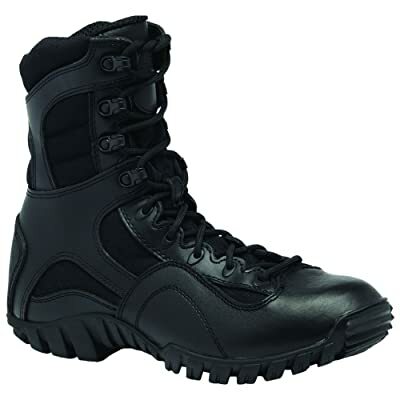 Your overall selection of tactical boots is cool. I always love Danner boots. These are durable, good looking. Though Danner makes the best boots compare to others, their price is also high. You might agree with me. At present, I am using Under Armor Valsetz RTS. It’s an excellent boot (lightweight). Anyway, Thanks for your bonus tip. No Lowa Sephyr or else ?